Joann Williams McMeen passed into the arms of Jesus on Palm Sunday at the Harris Hospice Unit, Presbyterian Hospital. 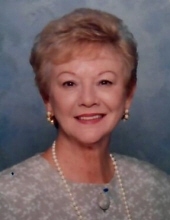 Joann was born in Charlotte on January 7, 1933 and was the daughter of the late Ruth Doster and J. Adam Williams. She also lived in Dallas, Texas and Hilton Head, SC during her lifetime. Joann was a multi-talented lady. She owned a restaurant, a catering business, made stained glass windows and was an excellent seamstress. She made beautiful doll clothes with delicate trim, beautiful tiny buttons and monograms for her daughter, Robyn's, Barbies and Shirley Temple dolls. . In her younger years, Joann enjoyed golf, tennis and bridge. She also volunteered in the community in many different areas. Joann loved her longtime best friend Norma Maloyed. Through her life she loved many dogs especially Lucy Lou, her Papillion. We are so grateful for the caretakers at First Light Homecare of Charlotte, Elizabeth at Carmel Place and her excellent healthcare provider and friend, Mary Dore, PA-C.
Joann is survived by her daughter, Robyn Stump and her husband Randy. She is also survived by her grandchildren John and Erin along with Erin's fiancé, Will Sparks. At her request, Joann's ashes will be spread over her Mother's gravesite at a later date. Memorials may be made to Brookstone Schools at 301 S. Davidson Street Charlotte, NC 28202 or Search Ministries at 1043 E. Morehead Street Charlotte, NC 28204. To send flowers or a remembrance gift to the family of Joann W. McMeen, please visit our Tribute Store. "Email Address" would like to share the life celebration of Joann W. McMeen. Click on the "link" to go to share a favorite memory or leave a condolence message for the family.